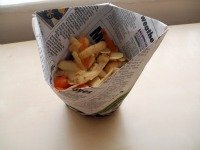 This Origami Cup Makes Composting Easy and is Quick to Make! 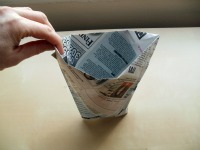 This origami cup is made from used newspaper. 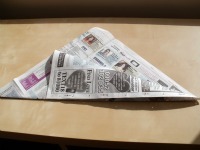 You can use a few sheets together if you have very wet stuff to compost e.g. lots of not very squeezed out tea bags or rotten veg. Who wants to spend a fortune on bags that disintegrate!! 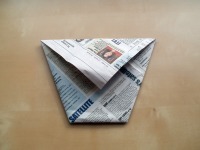 First of all we need to make a square from a piece of newspaper. 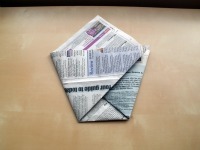 Fold the bottom right corner up to the top edge and fold it down flat as shown. Cut off the spare bit and put it in your recycle bin. 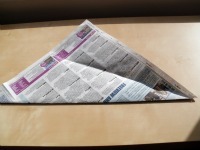 Fold the top corner down to the bottom edge. 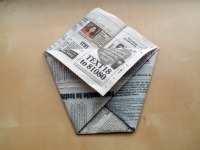 Where it meets the left side of the square squash the paper down to form a crease. 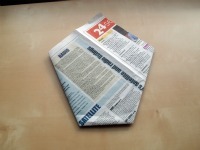 Only fold the rest of the paper very loosely. Unfold this. You should be able to see the crease where the paper met the left edge. 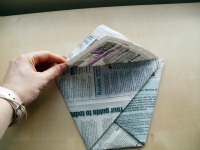 Take the right hand bottom corner and fold it up to the left edge. Make the corner meet the crease you made earlier. 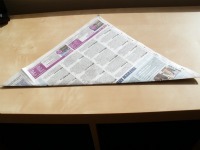 Flatten this fold out properly all along it's length. 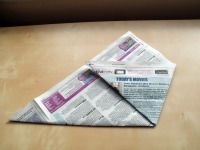 Fold the left bottom corner across to meet the right side. Make the corner meet the top fold exactly as shown. 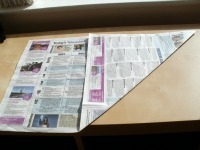 Fold the top layer, top corner down as shown. 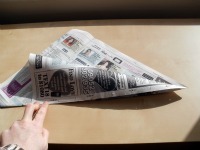 Press this fold in firmly. Do the same on this side to complete the cup. And there you have it, the completed cup. Open it out and put it in your counter top compost bin.